Alejandro Armas died this morning. If not the main leader, certainly one of the most influential leaders of the Venezuelan opposition, and probably one of the most upright and decent politicians in Venezuela. He started young in the communist party cells of his high school and all his life he was linked to the leftist sectors of Venezuela. Naturally when the left in Venezuela saw in Chavez the chance to effect the reforms that they had been hoping for all these years, he became one of the supporters and tireless workers of the movement that brought Hugo Chavez to power in 1998. He did work in different positions within the campaign and the first two years of chavismo, becoming an Assemblyman in 2000 and the chairman of the finance committee. A committed leftist he had learned through the years that reform had to be paid for otherwise it risked abject failure. Soon through 2000 and 2001 one could sense that Alejandro Armas was having some difficulty to adapt to the spend free style of the new administration. Having worked as a bank director Armas certainly knew how to add and rest. When late 2001 the "enabling law" finally published the 48 laws that initiated the political rift that have besotted Venezuela ever since, Alejandro Armas took upon himself to set up an evaluation committee to try to establish some dialogue between the two camps and review some delicate issues of the new laws. Issues that I would say myself unnecessary Chavez provocations to the Venezuelan business and middle class. Chavez, furious, condemned that initiative and Armas ended up in the hospital with an aggravation of his cardio vascular disease. Came April 2002 and the final break up between the moderate sectors of chavismo and what was now El Supremo. Alejandro Armas with his mentor Miquelena and a few other folks created the Solidaridad movement that joined the opposition ranks. Never strident, always composed, always to the point, always clear in his democratic and social commitment, Alejandro Armas quickly gained a considerably ascendancy among an opposition that was very weary of him at first. By late 2002 he had become a leader of the opposition, one of the participants of the team that undertook the lengthy negotiation process that eventually forced Chavez to accept that the opposition tried its hand at collecting 20% of the signatures of the electoral rolls. After the signature of this agreement Armas was without contest one of the top 10 leaders of Venezuela, period. It is incontestable that his deep knowledge of the side that he used to belong to was of great help for the opposition as he knew what made tick the remaining chavistas. It is incontestable that his social conscience and his unwavering commitment to democracy helped the opposition edge out some of the extremisms that had found there a play ground. As a country we have an huge debt to the memory of Alejandro Armas, indefatigable defender of constant dialogue, and moral strength, as negotiation tools. The genuine expression of grief of his collaborators, rarely seen in politicians, and those of his negotiating team partners (from the opposition, chavismo is mute so far) tell us how appreciated he was by all, and how important he had become. I can say that, one year ago, having had the opportunity to shake his hand and express my admiration for his work will be one of my cherished memories. But I cannot finish this eulogy of sorts without having a reflection on the nature of chavismo, on how this one has expelled one by one all of those that had moral integrity, human decency, unquestionable honesty, and democratic values. Chavismo is now an empty shell, with a single leader only interested in his political survival while his underlings use their very limited intellectual abilities to loot the country while their sycophancy leads them to all sorts of unspeakable acts to ingratiate themselves to the Great Leader. Alejandro Armas was one of the reasons why so many people hoped in 1999 that Chavez would bring positive changes to the country. Alejandro Armas was a real social democrat committed to the betterment of his country,a practical intellectual, a cultivated man, certainly not one of the pseudo leftist intellectuals that see in Chavez a way to boost their own mediocrity. Alejandro Armas is the victim of the beast that he exposed once he appreciated its true nature. It is not farfetched to say that Alejandro Armas who used his weak health in a relentless effort to preserve democracy for us, is yet another of the victims of chavismo. As surely a Chavez victim as the dead of April 11, February 27 and so many other dates since a certain February 4, 1992. Do I want him out? The campaign is going on. All sorts of activities can be found in addition of plastering public buildings. For example, at street corners a few people set up some stand and try to distribute electoral information. Meetings are called. Marches held. Last Monday running around Caracas I spotted in the heat of the 2 PM sun this stand held by about 6 people, from the opposition and for the SI option. It was in the opposition stronghold of El Cafetal. I took a picture of it because it is actually a small affair, run by the people living in the immediate area. We had a pleasant chat, I inspected the material, ordered a T-shirt with something like 100 forms to say SI around the world (though I could not go back next day to pick it up), and I took a few pictures, though I am posting this later than what I did promise these folks. 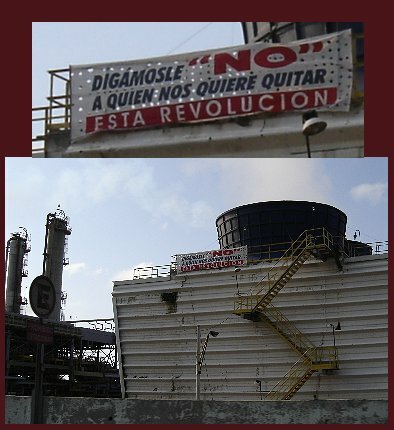 Today there was a rally for the NO in San Felipe. This being Yaracuy, a state where the political violence is lower compared to other places of the country, I decided to try my chances and see if I could visit. Not mentioning that the loudspeaker noise was coming so strongly to my place that arriving from work I decided to might as well leave again. It is my opinion that Governor Lapi did have a much, much larger turnout. But let's not focus on size. What is important is that the pro Chavez rally was peaceful if loud and that I was able to circulate through the rally. But similarities to an opposition rally stopped there, at least for me. Through the thick of the rally, I got a few nasty looks, in particular from men 50 year old or more. After a while I saw a group of women sporting a red shirt that said "San Felipe vota NO". I asked them if I could take a picture of them and I was met with a definitive refusal form one of them. The other ones looked at the one that refused and stayed put. I did not insist and walked away, having been refused a picture at a rally for the first time! Ethnically the rally was not distinguishable from the Lapi rally of June but the social origin seemed to be poorer in general, not surprising of course. Where things got very different was in the words of the speakers and the atmosphere. One of the speakers was a woman and her speech was pretty much all anti US and anti Bush. Nastily on occasion. And with a feel of rehearsed that was unmistakable. But that I can deal with. What did worry me more was that the rally was not a joyful affair at all. These were not people confident of their cause, but determined and grim folks, determined to resist whatever it is that they think they got and might lose on August 15. I am sorry to report that, but the opposition rallies that I have attended had a party like atmosphere not to be found this afternoon. At any rate, I wish to underline that the rally was peaceful and Yaracuy like. 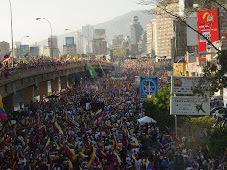 I doubt very much that I would have felt as safe in Caracas in a pro Chavez rally if I were to go there alone. This afternoon I had absolutely no qualms in diving through the crowd even if I got some not very pleasant facial expressions, none of them was nasty enough to make me reconsider my presence. The advantages of living in the province where polarization has not been as damaging as it has been in Caracas. A secure and confident Chavez administration? As electoral campaigns progress each side tries to project an image of confidence, of favorable polls, of creative ideas and what not. But as we look to what is going on in Venezuela with the office holder campaign one cannot but fail to be impressed by the contradictions between the message and the actions. In short, while Chavez says that he is going to electorally trash the opposition on August 15, the actions undertaken by his minions do not project such an image. Let's see a few cases in point. A 4th director of the Sumate board, Ricardo Estevez, is indicted of conspiracy and who knows what from having received 53 000 US dollars from the NED. As I have pointed out earlier, whether this grant was legal or not, a lot of other civil society organizations got such grants and for larger amounts. All in the open as the NED must account to the US Congress. Not to mention that 53 000 bucks are certainly not enough to even scratch Chavez hold to power. The indictments to Sumate seem to suffer from some legal defects, to put it mildly, to the point that one of the justices of the Penal Court of the High Court emitted a ruling to ask for the dossier and check it out. That justice, Marmol de Leon was cited by the Constitutional Court. She is known to have had significant differences of legal opinion with the head of her Penal Court, Angulo Fontiveros who happens to be known as Chavez partisan. Marmol de Leon was not shy with words today. Plainly, she stated that it was the first stage to put her on trial. It is for all to see that chavismo is trying to pack the court. This started with the new judicial law. Now that it has been passed, while they wait for the new 12 Justices to be appointed, they are trying to get rid of the "unsafe" ones. They either force them to retire or they simply throw them out as was done to justice Arrieche. She is too young to be forced into retirement, and although she was not the only one to sign the ruling she is the only one cited for judicial malpractice, for lack of a better word. She was cited even though the Penal Court said that her actions did not constitute a conflict of attributions. Yet, the Constitutional Court went ahead to cite her, meddling just as they did for the signatures cases (the justices of the Electoral Court have been "retired") and with a celerity that betrays the government interest in liquidating Sumate. There apparently nothing that the Constitutional Court will not do to eliminate Chavez enemies. A major source of trickery to cheat on elections has always been the manipulation of the electoral rolls. The electoral board CNE seems to become a master at such things. All sorts of problems are reported at the CNE, from the departure of people on vacation (at 2 weeks from a major election?) to shifting voters to new electoral centers. Perhaps 1 million people have been shifted hours away from where they live and coincidentally most of these have signed the recall election petition or are opposition supporters. But as usual the CNE is slow to give the final listings so all sorts of rumors are fed. The CNE is not above to try other fronts. One is the insistence by the pro-Chavez directors to go through a burdensome finger printing collection at voting day. Supposedly that would avoid electoral fraud. Well, maybe, but electronic finger printing is an untested procedure during an electoral process, and it seems that it could result in the collapse of the whole system at election day. But the worst might be the rumor that 18 000 workers of electoral tables (drawn at random by law among the citizenry) will be booted! Apparently they did sign for the recall election and thus cannot be trusted for objectivity at holding an election center. And what about those that did not sign for the recall election? How does the opposition know whether they support Chavez or just do not care enough? Curious concept of objectivity and democracy form the part of the pro Chavez directors, in particular Battaglini, the "taliban" of the trio. As we say in Venezuela :cada ladron juzga por su condicion (every thief judges accordingly, or: one judges people according to one's values). Two types of censorship have been attempted by Chavismo. International observers have been fought by Battaglini, a rector on record more than once that they are nto needed. Yeah, right! As if the infamous repair signature episode was not blown up by Carter himself! Undaunted now Battaglini has made it a personal crusade to boot out the Carter Center. Now he is warning the Carter Center that it should not start observation before August 9. This coming after the OAS saying that it would abide by OAS rules and not the CNE. Obviously Battaglini battles the weak link first. Little does he know. The second censorhip attempt was to fobid broadcast of a new video. Within 24 hours "Cual Revolucion?" went from being censored to be allowed again by CNE Rodriguez. The sin of the video? To show in 1 hour and 15 minutes the 5 years of Chavez rule. The fact are so damming that in a panic move servile Rodriguez on his own took the initiative to ban the video, making himself once again a fool. But a side story drew some attention. CANTV, the big private phone system of Venezuela was suddenly accused to prepare a fraud during the transmission of electronic electoral results by the Vice President, additionally bemoaning the fact that CANTV is not state owned (yeah, right! it is easier to control people through a state owned company that decides who gets a phone, and who gets spied on, Cuba style). This about the business that has transmitted electronically all the Chavez elections victories. Eventually the government realized that they were being ridiculous and a face saving agreement was reached where the government would "watch" the CANTV technicians. But the Vice was not going to go off the hook that easily. A strange incident made Carabobo's governor Salas Feo wonder about some missing explosive material from a supposedly well guarded military facility without a shot been fired, nothing, not a hint how this happened. He thus accused the vice of leading some gang about to start trouble and thus cancel the recall election. Rangel dismissed it with irony but without counter suing for such an accusation! Strange indeed! And of course we cannot leave without the altest round of the polling wars. Chavez said in his Sunday show that the opposition was afraid to show its polls because they were showing him winning handsomely. And then coincidentally PDVSA popped out a poll from an obscure company that gave Chavez a ten point advance. Unfortunately for Chavez Mercanalisis, a serious polling joint, had brought some numbers on a June sample where Chavez is losing by more than 15 points. Confirming its results from May, by the way. Mercanalisis as I mentioned in an earlier post is one of the serious polling places and in the past predicted rather well the Chavez victories. So, what is the real story there? Finally, just for the fun of it. The shameless papering up of public space by Chavez propaganda is heartily denounced more and more, while of course the SI posters cannot even get anywhere close. While people such as the ineffable Lara go on to say that there is no law to forbid it so they will put their banners wherever and forbid whatever. Strange concept or democracy and public property. Unluckily for an administration trying to prove that they do not use public funds for such displays, one leader of Argentina's Piqueteros admitted that he got money from Venezuela to go there and support Chavez. Luis D'Elia, admitted Wednesday to have traveled to Venezuela to participate in the electoral campaign of President Hugo Chávez for the August 15 revoking referendum, "with all expenses paid by the Bolivarian government," the news agency DPA reported. D'Elia, who is known to favor Argentina's President Nestor Kirchner, was in Venezuela for several days to remark the Venezuelan opposition's support to the "U.S. interests in the region." It is all just unbelievable! And I am not even mentioning all that I have seen on TV! I have been busy with work and house guests thus no posting since Saturday. And these when things are starting to heat up again! But I am back for a few days at least until I travel again for a few days. Before I try to catch up on a couple of important points I did translate quickly during lunch this article from Javier Brassesco. I have translated him a while ago, since we both share the idea that chavismo is some form of cult. Today he writes in El Universal on his reasons to vote SI on the 15. Amusing, interesting and to the point. While you read this I will be writing on Chavez is trying to catch up in the polls or in the tricks, as the case might be. Let’s see: the revolution continues to be a yearning of all the men of good will, regardless whether it has been betrayed by an unscrupulous government who uses it and manipulates it for its own benefit. The day will come for the authentic revolution, the real one, the one that will redeem the downtrodden of this earth, the one that will save us all from ourselves. If you see eye to eye, dear reader, with what is written in the previous paragraph, you’d better stop reading now and get busy with things of greater benefit to you. Because truth is that I always thought that this which we endure in Venezuela is indeed a revolution. Just as the one of “March”, the “Libertadora”, the “Restauradora”, the “Legalista”, the “Blue” or the “October” ones, just to mention those that happened on our land, the "Bolivarian Revolution" has for main objective Power, to stay in Power the longest possible time. Everything that it has done aims in that direction, and in the name of the most sublime ideals the only thing that it has done is to generate misery (and remind you that I am not going to talk numbers or of the one hundred billion dollars received only from petroleum, no; in order to verify this it is enough to stroll our streets). All the same, the revolutionary ideal keeps burning in the people of good will. Same thing happens with Communism: the fault is with the Soviet evildoers who perverted and bureaucratized the primeval doctrine to end up collapsing without firing a shot; that bureaucracy and static lodged in Cuba have nothing to do with a communist regime. And thus they will keep going from one deception to another deception, getting excited with any demagogue who utters the three inanities that they wish to hear (as right now do some intellectuals, for lack of a better term to describe them, who from the safety of their countries are pleading for the avenging and redeeming Venezuelan government) to feel in the end betrayed and surely used. The revolutionary yearning, nevertheless, will continue palpitating in their immaculate bosoms. Cioran said it well that men always will be enslaved until they are not cured of the odd habit of hoping. I have many reasons to vote for the SI on August 15. I do not believe in Messiahs in any aspect of life, neither in religion, nor in the personal, nor in sports nor in politics. And much less in one whose incompetence and ignorance are only overtaken by a gigantic ego. I will vote SI because I do not resign myself nor I want to get used to this daily occurrence of mendicants and peddlers, of people sleeping in the streets, wiping windshields at each intersection or selling cookies in the middle of the traffic while a few pile up fortunes and a few other turn a blind eye. But if I had to give a single reason to explain my vote, then it would say: I will vote SI because I want a government that is not revolutionary. At any rate. I do not know at what time Zamora declared but this afternoon driving on my way to Caracas for the week end, the banners I caught yesterday were in place. And there was even a new one, even including the PDVSA logo but a National guard vehicle parked under. I passed and that photo op. Or this would be the slogan that Chavez would like us to believe. "PDVSA ahora si es del pueblo". One would be led to think that during the 2002/2003 strike Chavez freed us from some nasty bureaucrats that somehow had managed to take over PDVSA without anybody realizing it until Chavez came into office. Well, there is a new meaning given to this slogan. As the referendum campaign proceeds, we are seeing things never seen before, and certainly not to the extent and crassness seen these days. All sorts of public places are now covered under pro Chavez slogans, in particular the red NO!. And I mean public in that they belong to the people as in social services, schools, etc, places that normally should never see electoral propaganda. PDVSA, the Venezuelan oil company certainly will not escape this. Peopled now with political hacks that are more busy about looting it than making it productive (well, it does produce for them) PDVSA certainly has a lot to fear in case the political winds shift in August. Accounting, for one. I had to be in Valencia Friday. And when I go there I drive by the El Palito refinery. This one was made famous during the strike of 2002 when the military took over and nobody from the independent press has ever been able to visit since. It has become the source of all sorts of wild rumors. Actually, to protect it from inquisitive eyes, PDVSA has set all along a concrete barrier on occasion gaily decorated by the local Bolivarian school children. In other words you cannot park along the fence and try to aim a telephoto. And if you were foolish enough to try that, the National Guard, abundantly posted around, would promptly seize your camera, at the very least. As I was a passenger I did take a couple of pictures while we passed by. Two pictures. In one I blow up the banner, the other one speaks for itself. That second one does have some of that painted concrete. Now to give you a sense of perspective on how wrong and immoral that is, imagine for a second the following scenario in the US: there is a referendum to decide whether US troops should remain in Iraq. Bush campaign banners plaster public offices and state companies with red posters that say "NO, we will not leave Iraq". Imagine yourself taking your Armtrak commuting train and seeing such a banner welcoming you at the train station. And no banner anywhere saying "SI! Bring the boys back" except in front of private places. Would you stand up for it? Even as an Iraq war supporter? One thing that I enjoy about blogging on Venezuelan politics is that sometimes I write something that might seem to strain belief, and within a few days events manage to confirm my prediction or comment. A couple of days ago I discussed in which aspects chavismo could be assimilated to your average fundamentalist cult. Well, today from the home page of aporrea we get this lovely picture. I will be the amateur deconstructionist here. These match some of the characteristics of the devil except that he would be more macho. I need not comment of course on the US flag use. The message is quite clear. On the other hand you have Maisanta, the road robber turned hero and apparently one of Chavez relatives. He is the code name of the Chavez campaign. He has the nose of Chavez. He has the lips of Chavez. He does has grey hair in spite of his young age, suggesting of course wisdom. Maisanta seems quite amused while pinching the ZI shirt bottom while the horse shows contempt, the rightful contempt of the people for such a wretched creature. There is even a great detail (perhaps accidental?). The t-shirt of ZI is actually rather drab when you think of it. But it has the three colors of the political parties that signed the "Pacto de Punto Fijo" that gave Venezuela 40 years of relative peace. Some people might think that I am exaggerating a little bit. I will remind them of the August 2002 public uttering of Juan Barreto in front of the High Court while inciting to violence a group of chavistas out of control. "Los Patiquines Maricones de Primero Justicia", the faggy preppie boys of Primero Justicia. If you want to see what Primero Justicia represents for chavismo you can read Alexandra Beech excellent post. No, chavismo has a long story of using homophobic comments when it is away from the cameras, and even in front of them sometimes when Chavez suggested the opposition to roll their newspaper and stick them [pregnant pause] in their pocket... They have been careful not to show that ghastly face, but they use it, and more often. Like any fundamentalist creed, they are not afraid to use personal disqualification and ignoble tactics when necessary. I do not wish this to be construed as an attack on Aporrea. They are what they are. It is just fun to see Aporrea on the same page gloat about the Brazilian intellectuals coming to Chavez rescue and show a homophobic cartoon that probably would cost them some support in Brazil. PS: I have the complete picture that also shows the day when it appeared in Aporrea, just in case they were to withdraw it. But if they write to apologize I will withdraw this post gladly. I have finally updated my link section. I also made a special section with a direct link to some of the posts that could be of help for understanding the main issues influencing the Recall Election campaign in Venezuela. I hope it helps, if anything by saving time when readers need to check out something quick. The bulky table is gone, thanks to the search engine for the site. Suggestions, as usual, are welcome. I wrote this week end about the fundamentalist nature of Chavismo. As it is to be expected in such type of movement, it comes with a certain dose of paranoia incorporated. Let's see what it does to some of its followers. And yet, what have we been witnessing these past few days? The most ineffable William Lara has announced with all seriousness that the opposition has an evil plan to sabotage the recall election on August 15. How would that dastardly deed work out? Well, the opposition will very early ion the morning bring 2.5 million electors (which they will, evil or not). At 10 AM all sorts of "accidents" will be happening such as dropping coffee or soda on the voting machines and thus sabotage the referendum. Jesse Chacon, the communication minister, famous for his bloody assault on a TV station in the 1992 failed coup, went to the CNE to complain about the "imbalance" of the news coverage in the opposition media. Now that is fine and dandy and certainly the opposition media is favoring the opposition just as the official media is favoring, and way more, the official positions, without forgetting the "cadenas". However the minister took the time to count the percentage of cartoons that are in favor of the opposition, naming directly El Universal and El Nacional. I am not making this up, according to Chacon: "the political cartoons have been used in more than 50% linked to the Sí"(sic, sort of). Leaders of the groups more active in organizing the grassroots efforts to organize the Recall Election vote are been pursued and indicted for the most ridiculous reasons. The government of course knows that and in some cases the indictment come more than a year after the alleged crime. But the strategy is very clear: the guys must now spend time with their lawyers to prepare their defense instead of organizing the grassroots work. The financial cost to the government: a few cheaply paid hack lawyers. Thus we saw this week Horacio Medina, Gente de Petroleo, all the ex-oil workers now working hard to get back their jobs through the vote, and the third in charge at Sumate, the organization that did all the logistics for the Recall Election petition drive, Luis Henrique Palacios, being cited to court, both leading the two most effective organizations of vote gathering. The government is trying to make a show of international support, a show organized by the exquisite Samuel Moncada. So we got a group of Brazilian intellectuals sign up a letter which title is "If I were a Venezuelan I would vote for Chavez". The letter is brought to Venezuela (who probably paid the trip) by one of these intellectuals (?) who found himself on some podium with Moncada, Richard Gott of Britain and the Anglo Pakistani journalist Tariq Ali (whose trips I leave the reader to wonder as to who paid the tab). The inanities proffered were quite something (Gott conveyed Tony Benn best wishes, I thought he was dead, well, he is politically dead anyway). More notably was the tone used, which was almost angry! Why such anger if they do not live in the country? Aren't they supposed to be cool headed and impartial observers? That was strange. But the most ridiculous part of an already quite ridiculous event was that it quickly turned out into some anti Bush platform as to Iraq, of course. Tariq Ali had no qualms in asking "where are the Venezuelan tortured and prisoners like in Guantanamo?". I mean, from under which rock has he crawled off? Has he heard of February 27 2004 in Caracas? I mean, is he paid off? Bad faith? Ignorant? Manipulated? Now, are these kind of activities indicators of a government that feels confident of an electoral victory? I think not. How can we interpret this? How come a government that controls almost everything is able to accuse the opposition to prepare a massive fraud? And believe it to the point of having to hire washed out leftists to come and make a case for itself that it is unable to make? It is very simple: they have all become fundamentalist and they think that the whole world is out to get them. There is no way to ever reassure them unless the enemy is eliminated. And even then they would invent themselves a new enemy. I think the loony-bin manual calls that paranoia. Certainly trying to define briefly what has been the shifting "ideology" that has moved the country for the last 6 years is a fool's endeavor. Whatever I could possibly write below can easily be argued against, and if anything else, just labeled by Chavez supporters as a subjective criticism of what makes the Venezuelan masses palpitate. So, why at this late time should I even attempt such a definition? Chavez's followers have for their leader and the future of their movement. I will undertake to write as briefly as possible some of the interesting notions of Karen Armstrong. Then I will do the perilous exercise to fit them to chavismo and its historical perspective. HOW TO DEFINE A FUNDAMENTALIST MOVEMENT? Definitions abound. I will strictly limit myself to what I found in "The Battle for God". Very briefly, the thesis of Karen Armstrong places the roots of present day fundamentalism in the social and civilization changes that occurred in the past 2-3 centuries, where the conflict between logos and mythos appeared. Before that, humans somehow had a way to deal with myth and the meaning that it brought to their lives, while resorting to the practical aspects to solve their day to day situations. But as the technological revolution happened in the west, people decided to try to explain everything and thus made "the rational, practical and scientific thought" what drove their lives. But for some this failed to bring meaning to their lives. For some religious folks a return to "fundamentals" appeared a way to recover meaning. The best would be to quote some excerpts from the introduction of Karen Armstrong. myth was not concerned with practical matters, but with meaning. Unless we find some significance in our lives, we mortal men and women fall very easily into despair. The mythos of a society provided people with a context that made sense of their day-to-day lives. Myth only became a reality when it was embodied in cult, rituals, and ceremonies which worked aesthetically upon worshipers. logos was the rational, pragmatic and scientific thought that enabled men and women to function well in the world. We may have lost the sense of mythos in the West today, but we are very familiar with logos, which is the basis of our society. Unlike myth, which looks back at the beginnings and to the foundations, logos forges ahead and tries to find something new: to elaborate on old insights, achieve a greater control on our environment, discover something fresh, and invent something novel. logos has its limitations too. It could not assuage human pain or sorrow. Faced with the universalism of modern society, some people instinctively retreated into tribalism. The fundamentalist campaign [in the US of the times] was perceived as a battle. Constantly, the leaders used military imagery. Riley [a fundamentalist leader of the time] went further. This was not just an isolated battle, "it was a war from which there is no discharge." [Bryan] was "the spokesman of a numerically large segment of the people who are for the most part inarticulate. In fact, he is almost the only exponent of their ideas who has the public ear. They are part of the body politic and by no means negligible or to be regarded solely with derision as 'lunatic fringe' "
Clearly, some parallels to present day Venezuela are to be found. Myth has always been a very powerful force in Venezuela. Our ethnic background gave us a large collection of myths. Our history kept most people away from formal education and thus certainly favored the unique mix of cultures and traditions that has resulted in our character as a people. But among these there are two myths that have been carefully entertained by all political classes thought our recent history: first the Bolivarian myth and then the oil myth. Simon Bolivar is without a doubt, and deservedly, our national hero and one of mankind's hero for that matter. Such a life could only give rise to all sorts of myths that are most of the time unduly used for political expediency. From the heir of one of the greatest fortunes of colonial Venezuela, with an education stepped in the enlightenment, with a strong sense of class and belonging, Bolivar through history has become the excuse for all sorts of political actions, most of the time unrelated to his real life and thinking. His life is of course a fodder for the wildest imagination, from the glories of the "Campaña Admirable" (1814) and the creation of the "Gran Colombia"to the supposed betrayal by Paez in the late 1820ies and the birth of Venezuela as the Eastern part of the great confederation (2). Oil became an important factor during the time of Juan Vicente Gomez when a 3 million people country received a steady flow of money which allowed it to reach a certain development without the pain of having to pay for it. Unfortunately the country grew and the per capita oil revenue shrunk constantly to the point that even if a way existed to spread evenly the revenue to every single Venezuelan, it would amount to little bit more than a beer and a small snack a day for everyone of us. Yet, many think that if they are in the sorriest of states it is because "someone" is stealing their rightful share. Because, of course, with time oil revenue has become a birth right. The combination of these two myths has perhaps given birth to a sort of victim complex found in our psyche. Bolivar was betrayed. The ideals of the independence were betrayed. Our gift from the gods has been stolen from us. And there is no reason for us to think that Bolivar might have been a lesser politician than he was a military genius. Or to consider that what we consider the loot of our oil gift could be our indolence at hoping that someone else would do the nasty jobs for us without been paid, or our careless attitude that as long as we did get something for nothing we did not care if a third party was getting much more than we did. Lesser myths have also layered the Venezuelan polity. From the leftist guerilla years we have a certain admiration for these guerrillas that went into hiding in the wet, thick and snake infested jungles. Che Guevara portraits have always been around in Venezuela and all governments did find good use for a well placed "Yankee Go Home!" graffiti, even if they paid others to do something that they could not be associated with. Castro was a friend of Carlos Andres Perez. But reality would catch up with Venezuela at some point. Decades of mismanagement forced the second administration of Carlos Andres Perez to take measures to give a more rational and competitive edge to an economy build on a rent mentality. This did cost him dearly, a massive rioting in 1989, two military coup in 1992 and eventually his expulsion from office lead by his own political party. A country where its leaders were the most consistent clients of astrologers, a country were many really thought that a lottery ticket was the way out of misery and up to power, a country were no matter what the Doctor at a fancy hospital said, a quick visit to the local "brujo" (medicine man, witch) was considered wise, could not easily accept that the world outside had changed. And it had. Oil was not enough to pay all what we wanted. And we wanted more. But as cable TV came in, as the globalization became a reality and a way to get all what we wanted, we did realize that there was a price to pay for it. There would be no Bolivar to lead us to this brave new world. There would be no lucky oil field that would take care of it all. We were told that we had to put order in our affairs. That gas had to be more expensive than water. That law had to be respected and that we could just not get away with things anymore, la "viveza criolla" (our street smarts mentality). Only Chavez for sure knows why he chose the path to revive all the Venezuelan myths in his discourse. But it paid off handsomely, at least for himself. Already during the 1998 campaign, the early stages looked more like a crusade than an actual political organization. Chavez was fond to receive people for talks while keeping an empty chair available, for the spirit of Bolivar. He came up with the "Bolivarian Revolution" where Venezuela would go back to its roots in the thinking of Simon Bolivar. Never mind that Bolivar did change his mind on more than one occasion. Chavez picked up what he liked best. His crusade/campaign slowly but surely became the winning ticket. Corruption, the main culprit of all of Venezuela ills, the main betrayal to the Venezuelan body, was going to be castigated at last. Chavez as an ex-military also appealed to a certain law and order fringe, to a time where it was thought that you could sleep with your door unlocked, to a time where a strong man would come and put order in the country, stopped all divergences and made us a unified tribe again where there was no need to steal, to cheat, to lie as we were all brothers. One tribe under one "cacique", and the Native American heritage on Chavez face certainly heralded to that, to the peaceful tribes that supposedly welcome the Spaniards. But more importantly, Chavez spoke like the people, with its idioms, its values, its syntax, its vulgarities even. Thus he validated their lives and transmitted the message that they did not need to adapt to the new world, that he was the proof that the new world could be made to adapt to their beliefs. Once in office the transformation continued. Themes were added with a Chavez becoming a Cacique Piaroa if needed, or renaming the October 12 holiday, Dia de la Raza, (day of our mixed race) into Dia de la Resistencia Indigena (day of native resistance) going againstany of the logos of our history. Themes were retaken such as the leftist love for Castro and his own iconic and mythos persona. The image of a Chavez sending kisses to Castro's plane is in all's memory. The globalization was excoriated and the FTAA became the boogey man, until the US president himself became THE enemy of the fatherland. Rituals were created. Military parades became folksy affairs. The replica of the sword of Bolivar became the state gift. And the original brandished only by the hand of Chavez in all the great national holidays as the most precious relic. The large gatherings at Avenida Bolivar with a Chavez arriving in an open vehicle crossing through the throngs of adoring people to recite inflammatory speeches had more in common with religious services than any rational discourse. Even a Sunday service was created with the radio program Alo Presidente that lasted longer than any church mass and was as rich with symbolism and meaning and comfort by announcing all the avenging actions of the government even if disguised as new projects. All seems to indicate that logos has left Venezuela. Chavismo operates as myth and as such it has met an undeniable success. Whether this is really a political system, a fundamentalist movement, a religion, or a sect, it is open to individual interpretation. But a few things are quite striking. Indeed, Chavez has brought back meaning to the forefront. He has tapped into the need of the Venezuelan people battered by 2 decades of set backs for some sense as to all of this mess, to some meaning to what we are as a nation. Whether we agree with Chavez explanation is not the point. The point is that the did offer a meaning. Thus, it does not matter if Cuban doctors in the "mision Barrio Adentro" (3) are any good, or whether they do solve people's problem, or if it is as efficient at restoring the battered hospitals. What matters is that Chavez creates the myth of a government finally caring for its poor. Karen Armstrong points out also that fundamentalism means looking at fundamentals but is not necessary a return to archaism. Fundamentalism can sometimes search for new solutions to old problems. Even that can be found in the discourse of Chavez. His anti US stance has brought him to champion any anti globalization stance and to try to become one of the heir of the Seattle battles. Perhaps his desire to unite South America into a trading block to oppose to the US is a real forward looking event though the end result might be made against his objectives: South America seems to unite to get a better deal when negotiating with the US, instead of excluding it as Chavez would like to. 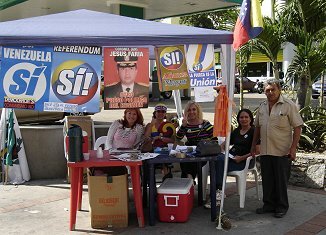 CHAVISMO AS A FUNDAMENTALIST MOVEMENT? Chavismo has many of the markers that would allow an observer to qualify it as a fundamentalist movement. It is not only that, of course, but as the tensions rise, the call for battle from Chavez himself, his manichaean division of society between those that are with him and the rest as his foes, are the hallmark of the preacher in full battle for good against evil. Is it proper to coin the term Chavismo when its instigator has only produced a book of all his speeches, edited in Cuba? But Chavez has been able to tap into the dark corners of the Venezuelan soul, promoting lady luck, militarism, victimhood, machismo and what not. The genius of Chavez is to have made these virtues and thus become the great forgiver of our faults as a people, the faults that brought us to our dire situation in the first place. Thus is Chavismo. 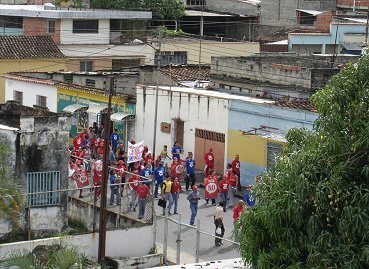 This afternoon chavismo tried to activate a little bit better its campaign in Yaracuy. I did hear a few of those loud trucks going around singing the "Uh! Ah! Chavez no se va!" and calling for a "caminata" (a walk, not a march) this afternoon. Not a very strong demonstration, but at least a peaceful one (for the noise) adequate for our small town atmosphere. Still, Lapi would have pulled ten times as many people! You can also see a mango tree full of mangoes. This is not a very original title but I have been busy these recent days and I have not been able to write. Still, there are a few things that need to be discussed and I will try to post a couple of things this week end. The Andean Community of Nations has authorized the negotiations that Colombia, Ecuador and Peru are conducting with the United States to reach free trade treaties, and Bolivia has indicated that it will be joining the negotiations in August. In taking this stand, the Andean countries have made it clear that they do not share Hugo Chavez’ idea of continental integration, which is always aimed at excluding the United States. But, at the referendum on August 15, Chavez will be putting this Bolivarian project at stake, a project that, according to him, is much more important than the economic interests of his own country and those of the Andean Community. This Monday defeat in Quito, where the Venezuelan voice was drowned by the other countries of the Andean Pact, even by Bolivia who is wisely waiting for the result of its own complex referendum on gas, comes right after the pseudo-triumph of Iguazu. There, Venezuela was granted a slightly better than observer status to Mercosur. Last post I discussed what is more likely a trap set by the Mercosur. Today I will discus the isolation of Chavez and how instead of benefiting from it, he uses it to weaken even further Venezuela's economy. After 5 years of glorious bolivarian revolution, the industrial tissue is destroyed. Business that have survived have invested little and most are technologically where they were at in 1999. The labor laws are uncertain as the administration has been unable (or unwilling?) to update the labor codes, threatening even to go back to the past regulations that have demonstrated to be not only detrimental to the private sector but to the public administration who is the worst deadbeat as far as fulfilling its contractual obligations. This is a double burden for the economy that cannot find the road of growth until a political settlement is reached and a legal frame work are agreed upon. In such a situation Venezuela is in NO POSITION to undertake any free trade treaty. Be it Mercosur, be it FTAA, be it Andean Community. It needs actually a temporary well thought "protectionism" until its basic industries recover enough to face the global market. Otherwise what we will be witnessing is rapid take over of inefficient industries, without little capital to modernize, being bought off cheaply by multinational concerns. Finally, the obvious market for Venezuelan oil is the US. Previous governments have wisely made sure that the US will be always significantly dependant on Venezuela oil to make sure that the amount of Venezuelan exports to the US is not too affected by the up and downs of the oil industry (CITGO is owned by Venezuela's PDVSA). This position gives actually a significant strength to any Venezuelan negotiation with the United States for some trade agreement. Chavez does not know nor cares to know and understand the workings of a modern economy. As Veneconomy points hints quite well, his only interest is to become the leader of Latin America. If Venezuelan interests are sacrificed along the way, so be it. For him oil revenue is his to buy good will wherever this one can be bought. Having a main client that pays well seems to bother him and he would much prefer having all sorts of small clients with all the additional costs that this would imply. A case could even be made that the downgrading of the Venezuelan economy is a deliberate plan and that chavismo would not be dismayed at all to see a few important Venezuelan concerns be bought by foreign interests. Solid evidence exists: the government did not try to stop the sale of the Caracas private electricity company to AE&S, and did not intervene when Bell South bought off the Cisneros group from Telcel, then the main wireless company in Venezuela. 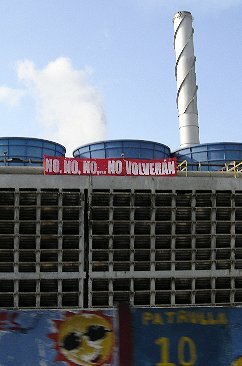 In fact one can guess a main interest for Chavez in seeing big business bought off: foreign companies are certainly less likely to have lockout as in December 2002, are less likely to finance any Venezuelan opposition, and if needed can be put under strong pressure by the docile chavista trade unions. There are very simple: find a fair way to have access to the largest market in this hemisphere, the US of A. You can do it the Lula way by playing hard to get (then again you are Brazil, the second market in the Americas) or the Andean Union way, by blackmailing the US with lowering drug traffic if other products can get in easier in the US (of course this remains unsaid in diplomatic circles and other arguments are advanced such as war on poverty or the proximity to the US market). Venezuela and Chavez do not fit. It is just that simple. Even Venezuelan oil is not really an asset as the rest of South America has been developing its oil production and even invested elsewhere to obtain their energetic needs. They certainly do not want to depend on the whims of Chavez for their oil! South American business and mainstream political leaders know best! Even if they pay lip service to their "progressive" political groups. Not only his style is not very propitious to seduce other South American leaders but his open gamble on new leftist administrations are down right irritating for countries that are hard pressed to retain enough stability to be able to try to solve the economic problems of its people (Bolivia and Ecuador in particular not forgetting his open liking of the Colombian FARC). If we consider that he does not bring anything positive to trade, and certainly not stability, it is no wonder that the Mercosur handed him a pacifier and the Andean Community, much more attuned to Venezuela's reality, sent him packing. Venezuela has become the troublemaker of South America that Castro was, allowing by the way this one to perpetuate his dictatorial regime. A REELECTION DEBATE IN VENEZUELA? Chavez is baiting with talks of running again, Mercosur, Bush and what not. Among Chavez many activities and uttered words while at the Mercosur summit, one took the front lines in Venezuela: he declared that even if he were to be recalled on August 15, he would be running for reelection 30 days after, to complete his term until 2006. My surprise is not that he said that, readers of this blog know that I am expecting the whole thing to either end up in a general election or a coup. My surprise was the reaction of most of the Venezuelan media. The only conclusion is that after 5 years too many in the opposition have still no idea who they are dealing with. The 1999 Constitution is an ill written, not to say sloppily written document. Apparently, the only ones that cannot run for office after having been revoked are the National Assembly representatives. Indeed, it is sheer logic that someone whose electoral mandate has been revoked should not run for office again, at least not right then (1). But in this land of wonders there is nothing legally written to stop president Chavez to run again the day after his revocation. The head of the High Court has said so in an interview to El Nacional this Saturday. The outraged opposition has screamed legal fraud. The talk on these last three days was concentrated on that announcement of Chavez, not on Venezuela knock at Mercosur's door and the probable consequences for us, not on his actions in Buenos Aires where his support for the "Piqueteros" probably greatly upset president Kirchner, or not even on the implied confession of weakness as Chavez is considering that indeed he could lose the recall election and is already gearing for August 16! This is truly dismaying for me, so many people in the opposition still arguing stupid legal aspects when in front of them there is a government that is laughing at laws while making sure that it packs the High Court with its supporters, to keep laughing at justice for years and years. Since I am sure that this page is very widely read by the leaders of the opposition, in particular by the ones that are willing to discuss anything stupid in order to make it to the talk shows, I will freely offer knowledge and advice. What comes next is very simplistic of course, but I am trying to get to the very core of the beast so I must be direct. I also must make very clear that the term "chavista", as used below, is only descriptive of the people that are holding office today, it does not describe the large mass of Chavez supporters that are still fooled by them. Chavismo is a movement that started as an agglomeration of all sorts of ideological currents and empirical opportunists seeking a job. It has decanted now into a pseudo socialist regime, authoritarian in character and methods, where those who count for anything are mostly those that originally joined for opportunistic reasons. In other words it has all the background for a political movement motivated more by looting the public treasury than really creating a new state. Or at most a state pliable to their whims and fancy. The welfare of the people, in a socialist sense, is a mere excuse to reach and hold on to power. We have a term in Venezuela that can be used for people like Chavez: resentido social. We apply this for people who resent society for any reason and seek to take revenge for real, and more often, imaginary woes. In general these people share one characteristic: they refuse to take responsibility for their actions and are always ready to blame whomever they can for their failures. If Chavez comes indeed from a rather broken and poor family, it is still a fact that the Venezuelan state allowed him to get an education to the point where he could lead a military coup in 1992, and a state democratic enough that it allowed him to be elected president in 1998 when instead he should have been rotting in jail. How do chavistas think, in politics? They do not think like normal democratic people. For them, it is their turn at the bat, to recuperate decades of having been left on the side. It never occurs to them that if they did not participate to the previous corruption of the 4th Republic, it was because they were just too incompetent to be hired for anything. For them democracy was a convenient way to reach power, benefiting from an unusual historical circumstance. Now they plan to stay in office, forever if possible. In addition, having presided the most corrupt administration in our notably corrupt history they know that if Chavez leaves office a few of them will go to jail, or to a golden exile for the rest of their life. It is to be expected that these people, including their great leader, will not play by the democratic rules accepted in most countries today. They will use every trick that they can get away with it, this being of course the XXI century where the whole world watches over, and wants at least the fig leaf of legality on any governmental action. Ethics are an unknown word for chavistas; expediency is all. For them it makes perfect sense that if Chavez is revoked he can run again and, benefiting from a divided opposition, he could reach office again with a mere 40% of the vote. They do not care if Chavez wins by a single vote or a million, in their world the winner takes all and winning is the only thing that matters. This mentality is closer to a street gang that took over Miraflores Palace than to a normal left wing democratic movement (2). That is why they have no qualms, no ethical hangup, no morals in packing all the judicial offices from the General Prosecutor to the General Comptroller; why they are packing, again (3), the High Court; why they shamelessly shut down any opposition initiative in parliament; why they use the oil revenue outside the budgetary process; why they have no qualms in financially starving opposition mayors and governors, resulting in severe cutbacks for the people; why they are creating a separate welfare system for their followers, letting the existing one go to seed, etc, etc... it is all theirs and too bad for the others! What should the opposition do (in particular the professional talk show attendants)? To begin with, stop being reactive to whatever Chavez hurls at them. By now they should know better. Talk about the High Court packing or whether Chavez should run again for office. Do you honestly think that the people that are receiving direct hand outs or services from Chavez "misiones", people that are at the lower positions of the social scale, people that never had access to justice, will care whether the High Court is packed or not? They are blasé and the only thing they may care about is what Chavez will give them, and what will the opposition give them if they make it to office. 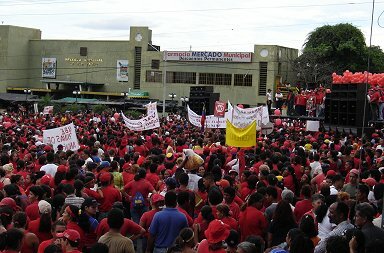 After the General strike of 2002/2003, chavismo decided to protect itself from food shortages "imposed" from the opposition (even though basic food items were always present through the strike, thus a rather hollow claim for chavismo). Thus was borne MERCAL, a distribution system managed by the state whose mission was to buy, import and distribute basic staples at lower prices than the private sector could do. In theory, as no accounting of the system is made public, prices are not that lower and quality seems under par. Nevertheless this was yet another golden opportunity to make some propaganda. This one was inserted inside the food packages and eventually the diverse slogans found their way to the label itself. Miguel reports on two of these labels. What struk me beyond the simplistic tone, an almost child like way to "educate", is one example they chose: Orson Welles famous radio show about the Martian Invasion. I am not so sure whether the popular sectors that supposedly are with Chavez know about this famous moment in broadcasting history. Still, someone within the chavismo propaganda machine came up with the idea that it could be used as an example on how media can lie to manipulate the people, the never ending chavista recrimination against private media in Venezuela. In other words, as an example on why control and regulate the media, (the unbelievable text in Miguel's post). Unfortunately it did not turn out so well. In the label they dated the famous broadcast in the 50ies, when it is actually on October 30 1938, Halloween's eve. Which makes me wonder about a couple of things: 1) No one bothered to check out the real date? 2) "the 50ies" is good enough for the hoi poloi? 1- It shows how they actually despise their own people that they do not bother to have the facts clear to educate them. The only thing that matters is the propaganda message. 2- It shows how sloppy chavismo works. How incredibly sloppy if you ask me. This story by itself illustrates perfectly well what the main problem of chavismo is: permanent improvisation, expediency, day to day management (if we can call that management). And I could keep going on. This is why the Chavez star has been fading: some people are finally realizing that they actually are just used and that Chavez is unable to deliver, no matter how much money the oil industry will provide him with. I never thought that the proof would be on a cheap rice package. This is live writing folks. As I type Chavez is having yet a cadena. The topic? Venezuela's inclusion as an associate member of the Mercosur. There was actually an interesting moment that Chavez tried to twist into his favor, though I am not sure it will work. Chile's president, Lagos, (who by the way is negotiating real well with the US Devil while inside the Mercosur) has been gingerly dealing with Chavez for quite a while. Even Chilean socialist don't buy Chavez populism. Well, while he was welcoming Chavez he was congratulating him on his political courage for accepting to go to a referendum. And right then added that the Mercosur should send observers, a lot of them, to witness such a fine moment, to learn from it themselves, help Venezuela to decide in peace and the losing side to accept the verdict. If you doubt my translation read about the tense relationships between Lagos and Chavez for the past 2 years. Actually socialist Lagos administration and initiatives are probably the ones most at odds with Chavez goals. And Chile is the country doing the best, by far, in South America, something surely that irks Chavez a lot. Actually I think that the Mercosur is playing a trick on Chavez. This one is having more and more problems with Lula and Kirchener since last February when they saw first hand themselves the violence in Caracas. I bet that they decided to let Chavez in as a way to force him to have a fair referendum on August (and perhaps hoping to get rid of him). After all the agreement is only to welcome Venezuela and there are a lot of negotiations still to come. If indeed it is a propaganda tool for Chavez it is also a noose for his neck as he will not be able to refuse the observers that Lagos et al. will send. There is a certain group of people outside of Venezuela that have made a career in criticizing the role of the private media (1). I wonder what they will think after Monday's events. That night I wrote about the rather scandalous use of politics in the military parade for the Independence Day of Venezuela, that is, the independence days of ALL Venezuelans. But it seems that we are reaching fast a situation where some Venezuelans are more Venezuelan than others. The reactions have not been long in coming. From Zamora, one of the directors of the Electoral Board CNE (2) to the searing editorial of Tal Cual. This editorial has been already partially translated by Miguel. Anyway, nothing new but with all the old one notch higher in tone, on a national day used for electoral demagoguery and to feed the insatiable vanity of the boss. A National Assembly and State Institutions transformed in adulatory sheep together with the tamed Armed Forces offered a pathetic note in the memorable epic to celebrate I do not know which independence. But an undaunted Chavez had no qualms in calling for yet two more "cadenas" on Tuesday, one to let the people now that thousands of people sworn in as new Venezuelan citizens were with the revolution, and the other, a long one at lunch time, to graduate a new crop of officers from the diverse military institutions and of course implying to them that they were there to serve the revolution. How? By reminding them that they started school in August 1999 as the New constitutional debate took place and thus they were the first real Bolivarian promotion. To complete the picture there is a festival of sorts that is held at our opera house, the Teresa Carreno theatre (3). The name of the Festival is "Venezuela no estÃ¡ sola: Florentino sin fronteras" (Venezuela is not alone: Florentino without borders). That would not be so bad after all, except that this is the title of the campaign commando of Chavez. But it gets better, passing this for news, the state TV has been passing live the sessions where speaker after speaker launches into tirades after tirades of lauds to the Bolivarian revolution, also known as Chavez, El Supremo. But the world is listening indeed, not the way Chavez would like to. In spite of all the incessantly heard complaints that the private media in Venezuela are unfairly criticizing him, in spite of all the cadenas he subjects us to, in spite of the non stop propaganda channel that the state TV, VTV, has become in violation of the electoral codes published a few days ago, it seems that Chavez message is not crossing well overseas. In an unambiguous interview with Andres Oppenheimer, Kerry was quite clear on what Chavez represents. If Kerry is elected, Washington might become even of a worse nightmare for Chavez. The Miami Herald reports also on this Kerry stance (here if link expired, and in Spanish in El Universal). In a televised interview that will air Wednesday in 19 Latin America countries, Kerry called the upcoming referendum in Venezuela ''a real challenge to the entire hemisphere'' and said that ''as president,'' he would ``work with the international community to bring pressure in the interest of democracy. Poor Eva Golinger, she will indeed have to vote for Nader now. Damn Liberals! They cannot be trusted! (4) It isunfortunatee that so many Liberals have tied the knot with Chavez realizing only too late the true nature of the regime. As the VIO files reported, and as all evidences point out to, VIO files or not, the work of the chavista defenders outside Venezuela does not seem to be paying off. At least, the ones that count do not need to watch CNN anymore, they know what is going on here. Thus we are left with the initial question: where is the fairness in news reporting? As the private media is visibly making an effort to invite more often chavismo to its talk shows, the chavsita media not only is far from inviting opposition folks over (at least I have not seen any in the recent days) but it is becoming an all and out propaganda machine at tax payer expense. And cadenas are already reaching a paroxysm when there is still a full month of campaign left. Critics of Venezuelan private media would be well advised these coming days to watch their commnents as they could lose their credibility. The state information machinery seems to be poised to outdo all the mistakes made by the private media in recent years. (1) Quite a crew, from Le Monde Diplomatique where Lemoine seems unable to speak of anything else, to the usual crew represented in Venezuelanalisis, in particulars Weisbrot now promoted to pro Chavez witness in US Senate hearings. They all try to convince us that all the problems of Chavez come only from a partial media. (2) The main two chavista directors in the CNE have curiously traveled to the USA for some meeting to defend their position and try to validate their work at the head of Venezuela. This at a time when significant delays are being experienced in the organization of the Recall Election, not to mention other due elections. As the days pass it seems less and less likely that the 15 August date will be made, which would have tremendous consequences. (3) Current chavista propaganda now claims that the opera "ahora es del pueblo". Indeed, it is used for all sorts of political activities by chavismo, with nobody knowing whether rental fees are paid, etc, etc… This as culture in Venezuela is going through one of its worst crisis, under the excuse that the people are the one that hold the real culture. The result is that there is no culture left, popular or not. As could have been predicted. (4) It is indeed very amusing to see all these US supporters of Chavez rather upset with the Kerry positions. Clear ones at that. Probably they are unable to understand that there is such a thing as National Interests that go above party lines, a concept totally alien a an El Supremo regime like the one they defend. Rainy season has started early this year and it has been raining almost every day since Easter. All is now green and lush, and water logged. On Sunday afternoon we had a strong rain coming as usual from the Caribbean, in the Puerto Cabello/Chivacoa direction. It was a heavy rain, like the monsoon like we get 4/5 times a year in San Felipe, when in my street there is so much water that the second step of the stairs to the door is under water. And the street has a slope! But the water comes rushing from the higher part of the street in such amount that a small car could be moved. If spectacular, it is OK as the houses and street are designed for drainage. But Sunday something happened. The rain intensity started going down, presumably as the heavy clouds keep on their way to Chivacoa. Suddenly there was a reverse in the wind direction and the rain came back from Chivacoa with a vengeance. The strong wind seemed almost like a small hurricane and the balcony of my apartment could not evacuate fast enough the water pouring through it horizontally. The water thus went under the balcony door and within 5 minutes half of my apartment was under water. I spent half an hour pushing the water to the bathroom and kitchen drainage. I thought that it was like the hurricanes I experienced in the US, maybe not a real one but something looking like one, with even an eye of sorts! But I was the lucky one, only rain water on my floors. The water logged side of a hill gave up when the second rain wave of Sunday afternoon came in. Not a big mud slide but big enough to clog a "quebrada", the terms we use for dry river beds that fill up suddenly with water during rainy season for a few hours after a rain. 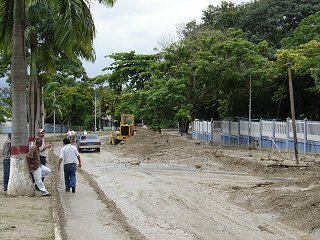 The consequences was a large muddy wave that took away about 4 dozen houses, placed too close to the "quebrada El Guayabito". As far as I can tell 3 people have died or disappeared, and a few are injured and more lost their humble possessions, since as usual people that live in those areas are land squatters that are allowed to build their houses in such places. 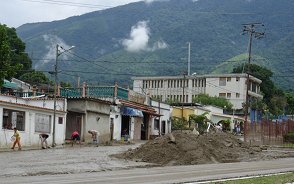 Even though the Yaracuy government is good about cleaning urban "quebradas" at rainy season, sometimes nature strikes. I tried Monday, in spite of my cold to try to go out. But roads to the neighborhood were barred, heavy machinery was at work. The streets were full of mud, I was with sandals, a bad cold and it was drizzling. Nothing really I could do. Except for these pictures of people cleaning their street and a view of a wide avenue where I occasionally stroll on exercise walks. Today I went to work and I planned to try again but I got worse and had to come back home to rest. I will try again tomorrow but I understand that it is almost clean right now, they are only looking for the body of a 2 year old baby girl that was swept away with her uncle trying to rescue her. The body of the uncle has been found. PS: El Universal does carry an article today with a picture of the damages.